If you’re running over to the Met to catch the Prada/Schiaparelli show in the next two weeks (don’t worry, it’s up until August 19), be sure to see the other rarely seen, worth-the-trip clothes – the robes, tunics, and kids’ stuff that’s straight from the Seventh Century. It’s the textile/clothing room of the show Byzantium and Islam: Age of Transition. It’s not often you get to see clothes from 430-870 A.D., much less see a one-room summary of all the cross-cultural fashion trends. It’s Byzantine fashion at it’s best, from a time when Greek Orthodox, Coptic, Christian, and Jewish lifestyles were all mixing and mingling across the Empire between the Seventh and Ninth Centuries. Radio carbon dating of the fibers gave the curators a range of dates on the outfits, but let’s just call it even by saying “Seventh Century”. In the fashion gallery of the show, you’ll see several tapestry-weave tunics (woven to shape), along with a small Egyptian kid’s fringed-trimmed hoodie (430-620 A.D.), a tunic with polychrome-pattered trim, and a huge, oversized Persian riding coat made of cashmere and wool. 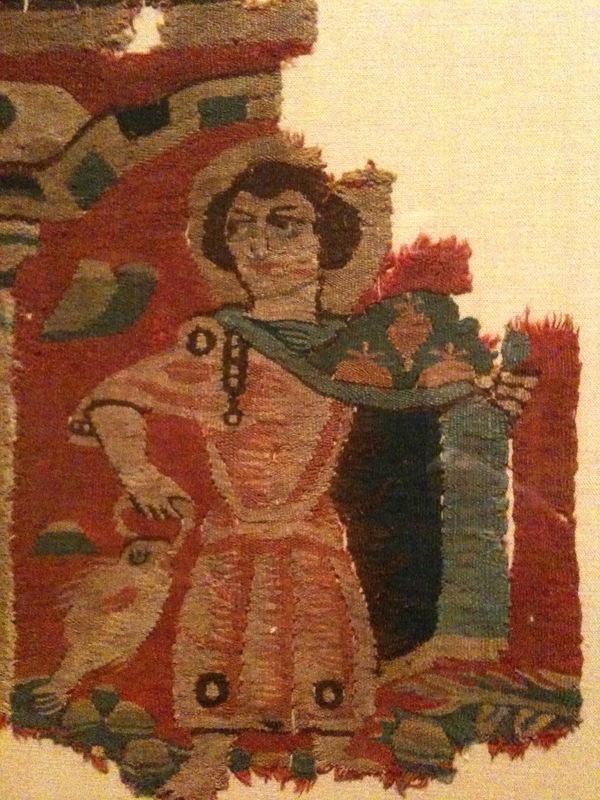 In a tapestry panel, you’ll see a veritable Vogue layout of various styles, including someone dressed in skins and boots below this more conservative tunic/mantle combo. Did they really wear that? You be the judge. This entry was posted in Art, Fashion, Museums and tagged art, culture, fashion, museums, style, textiles by mssusanb. Bookmark the permalink.